Frank Malzone happens to be my all-time favorite Boston Red Sox. He was born in the Bronx, played sandlot baseball as a kid in the shadow of Yankee Stadium and then got signed by the Red Sox. It took him seven years to make it to Fenway, slowed by both a dislocated ankle in Minor league ball and two years of military service. But when he did finally put on the Red Sox uniform, it was well worth the wait for Boston’s fans. His first full season in Beantown was 1957 and all he did that year was drive in 103 runs, average .292 and become the first rookie ever to lead the league at his position in assists, putouts, double plays and fielding percentage. That performance earned him a trip to the All Star game, a Gold Glove but not the 1957 Rookie of the Year Award. He was denied that when the baseball writers association that gives that award changed the rules, and all of a sudden the 75 at-bats Malzone had had the previous two years disqualified him. It was the biggest heist in Boston since the Brinks holdup. He would win a total of three Gold Gloves and make six AL All Star teams during his nine full seasons as a Red Sox. Unfortunately, Boston would release Malzone after the 1965 season, forcing him to finish his big league career dressed in an Angel uniform. 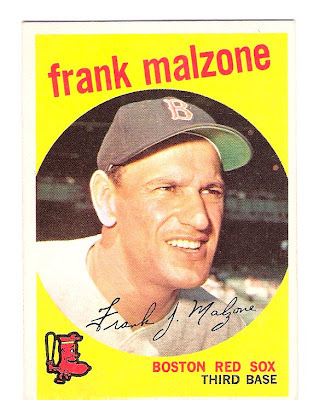 Even though the hundreds of Red Sox teammates who played with Frank during his tenure in Boston will tell you Malzone was one of the nicest guys they ever played with, he was most definitely not an “Angel.” Malzone realized that after just one year out west and retired after the 1966 season. His career numbers with Boston include 1,486 hits, 133 HRs, 728 RBIs and a.274 batting average. When his playing days were over, Malzone rejoined the Red Sox as a scout. I am Frank Malzone’s nephew! My dad passed @ 39 years & Frank & Amy asked my mom, my brother, & me to come to Boston every summer, which we did from 1957-1967! That’s the kind of people they were! I spent each summer playing ball in Boston & going with my uncle to many Red Sox games! Spending time in the club house & out with players like Ted Williams & Carl Yaz who both adored my uncle! I sat with Yaz’ dad at many games!